Parkland students and activists walk the 50 Miles More walk against gun violence which will end with a protest at the Smith and Wesson Firearms factory on August 23, 2018 in Worcester, Massachusetts. 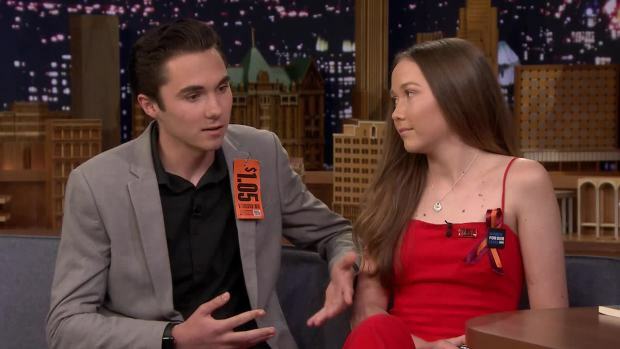 After the Parkland, Florida mass shooting, 50 Miles More was organized to engage young people in the effort to bring about gun reform legislation. Student gun control advocates and one of the survivors of the Parkland, Florida, school shooting on Sunday completed a 50-mile, four-day march in Massachusetts to the headquarters of gun manufacturer Smith & Wesson, where they protested gun violence and weapons manufacturing. More than 100 protesters rallied outside company headquarters in Springfield. They held American flags and signs that read "We Can End Gun Violence" and "Books not Bullets." Protesters said they also want the company stop making weapons outlawed under Massachusetts' 2004 assault weapons ban. That law mirrors a federal ban that expired in 2004. Their protest came as news broke of a fatal mass shooting during a video game tournament at a riverfront mall in Jacksonville, Florida. Parkland shooting survivor David Hogg, who spoke at the rally, called the march empowering. He said Massachusetts shows how commonsense gun laws work. Manuel and Patricia Oliver, whose 17-year-old son Joaquin Oliver was shot and killed in the Parkland attack, also participated in the march. Counter-protesters held signs across the street from Smith & Wesson supporting the gun-maker and the Second Amendment, which protects the right to have weapons. They held signs that read "I love S&W." Others held signs with images of firearms. State and local police kept the two protests separated on opposite sides of a four-lane road. Smith & Wesson didn't respond to requests for comment. The company has become a target for gun control activists because its military-style rifles were used not only in the Parkland shooting but in a number of other recent massacres, including the 2015 shooting at a California holiday party where 14 people died and the 2012 shooting at a Colorado movie theater where 12 died. U.S. Sen. Elizabeth Warren, who met with some of the students, tweeted that most of the students were born after the 1999 Columbine High School shooting and are determined to come together to fight gun violence. "This is how change happens," the Massachusetts Democrat tweeted.